Cool, dry high pressure has once again moved over most of the eastern two-thirds of the U.S. Pleasant weather today should return again tomorrow and Thursday looks pretty good as well. These are some of my favorites from when I was in grad school in Colorado. You only see them in mountainous areas. 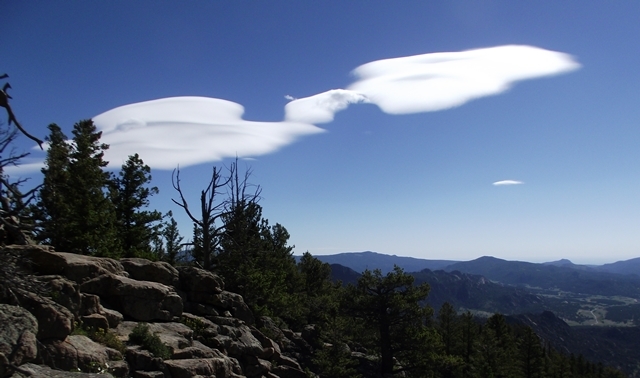 These are officially called altocumulus lenticularus. (higher altitude versions are called cirrocumulus lenticularus) More common names are “lens clouds” or “cap clouds.” Another common description is “standing wave clouds.” The “lens” or “cap” feature is very clear on these photos. The best example is the left side of the lower picture. Three good ones are on the top picture…one just to the left of the tall center tree…on the left edge of the photo and a small one of the right edge. The cause of these clouds is the barrier of the mountains. On days when the upper level winds are generally from the west AND there is just a little moisture on the air west of the Rockies (a pretty common experience, the air approaching the mountains between roughly 10,000 and 15,000 feet is forced to rise to get over the top of the mountain range which in Colorado is about 13,000 to 15,000 feet. This forced rising/cooling of the air condenses moisture only at the very top of the ridges, then fades away quickly as the air descends east of the mountain crest. This little bit of cloud formation gives the “lens” and/or “cap” nature of the clouds. 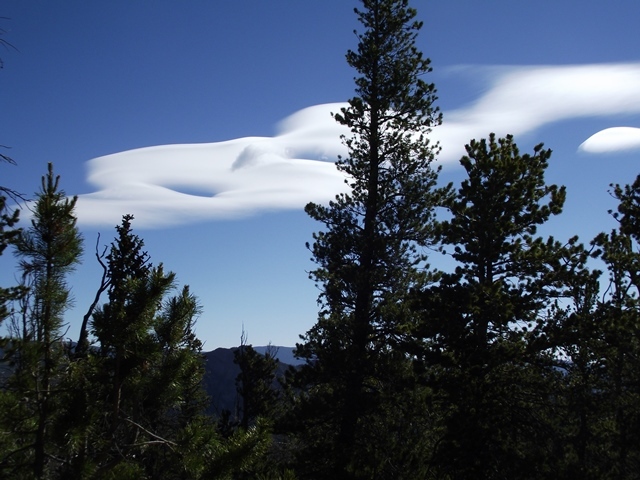 The standing wave cloud gets its name from the observation that the clouds do not move. You can watch them for hours and they still look the same. 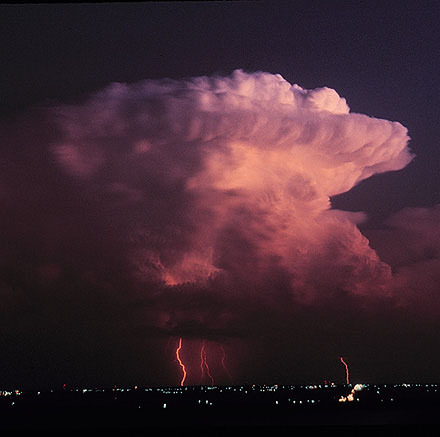 In reality, the cloud is changing rapidly – constant supply of the rising and keeps building the cloud from the west while the sinking motions to the east evaporate parts of cloud trying to move off the mountain tops. So, the clouds “appear” to stand still. On days when the conditions are almost perfect, in addition to the clouds standing on the mountain peaks, you may see as many 1-4 additional lines of “cap” clouds standing east of the hills out on to the plains. That’s even more spectacular! This entry was posted in forecast, weather on July 15, 2014 by wx.